Alexander Pushkin is Russia's greatest writer. He wrote poems, stories, novels and fairytales and you will find out a bit about him, his family, his writings and what happened to him here. I can say I’m no fool. Or made half as much noise. If I’d left the Lycée. Extract from "Mon Portrait", translated from the French by Peter France. What did his family say about him? What was he like as a boy? Can you imagine him at your school? Pushkin loved reading - even when he was meant to be asleep in bed. What do you like to read? What would your family and friends say about you? Imagine that Alexander Pushkin was in your class at school and write a story about that. Have a look at the alphabet on the Russian alphabet page and try to write "Pushkin" in Russian letters. 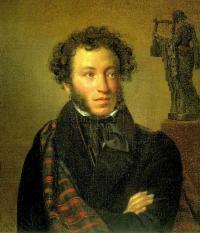 And now find out more about Pushkin - his life, some of his stories and poems, and more.